Any semantic search for insects? 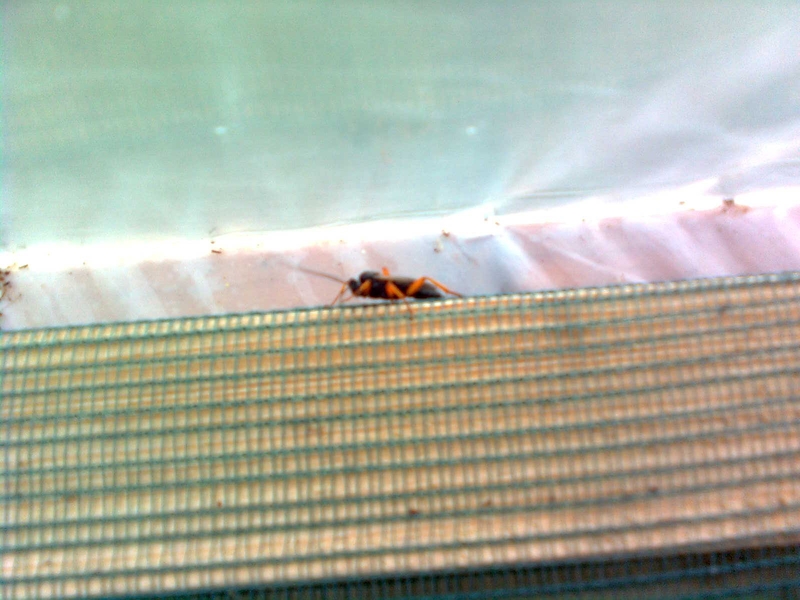 The draft of this post started with an example of a creepy insect living in Italy and, well, across the world in those locations where hygiene is not taken too seriously. But I will leave that be, so you can have a good night’s rest. 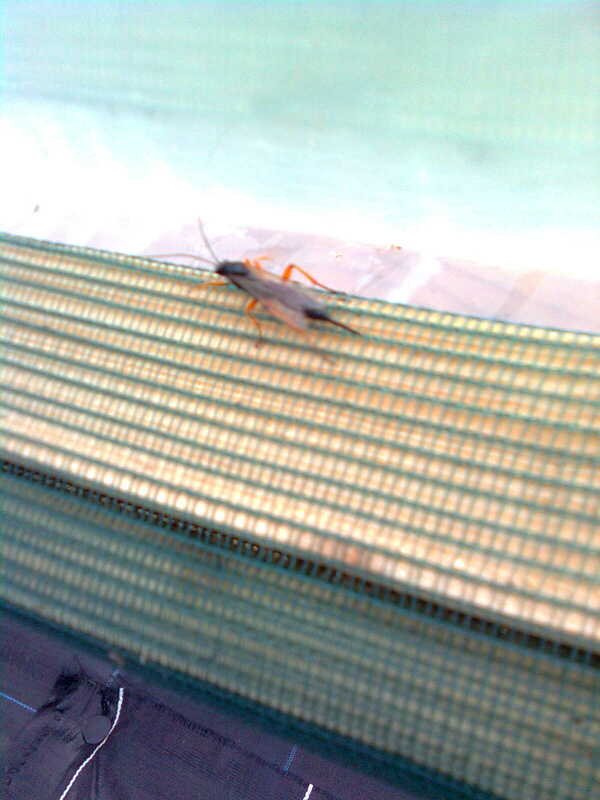 Instead, I will take the example of an insect of which I still do not know what it is—it may still turn out to be a creepy one, but now I do have photos of it and it is living well away outside in Ineke’s poly-tunnel near Limerick, Ireland. The problem is this: neither Ineke, nor Heidi nor I know what it is, but really still want to know. How to get the answer, i.e., how to find the species name of the specimen? I’ve tried several strategies: the ones that are practically possible did not do the job and the one that would does not exist. I’ll go through them in the remainder of the post and close with a few questions on what the most feasible strategy would/should/could be to eventually have a decent entomology [ornithology/nematology/etc.] knowledge base. Specimen viewed from the top; can anyone ID this specimen? Neither one of us who were present at teatime in Ineke’s polytunnel where we observed the insect, is an entomologist nor do we have entomologist-friends. The famous ‘bug man’ Ruud Kleinpaste is a fellow alumnus of Wageningen University, but we did not study there around the same time and I could not find an email address to bother him asking to ID a specimen. Neither one of us has an insect handbook either and even if we had, I, for one, would not want to flick through it when there is a perceived need to find the species of a specimen: flicking through the insect-book (and plant-book, etc) was an entertaining pastime activity when I was young, like reading the encyclopaedia and doing the dictionary game, but in this day and age, I would have wanted to use the computer to find the answer. This is theoretically feasible, but—as far as I am aware of—not yet in practice. To do image matching, I would need a very large data set and of the data set, to know which image fits with which species name, which I do not have; so the machine learning strategy will not work. There is an online browseable BugGuide for the US and Canada with lots of pictures that I clicked through for a while, but without finding the right picture. There are entomology databases that let me search by species name (here, here, and here), but not by properties of the insect; KONCHUR has a fancier search mechanisms but covers insects in Japan, East Asia and the Pacific only (“orange leg AND black body” did not return any results). Sure, I did a Google search on “image of a black insect with orange legs and stingy back”, hoping that someone else already has uploaded an image of another specimen of the same type of insect, annotated it with the same or very similar terms, and that someone has made the next step to add the name of the species as well, i.e., who is not looking around for the answer like me but has the right knowledge of insects. With the many search phrases and pagerank algorithm that Google relies upon in devising the search results , something might turn up; however, the actual results were unhelpful. Other people had similar requests without an answer, the body colours swapped twice (orange bug with black legs), many unrelated insects where one of them has orange legs (Ichneumon wasp (Rhyssa persuasoria)) but its legs are only partially orange, it has white dots on its body, and the back is not as stingy as our specimen (see picture of the Ichneumon wasp), or utterly irrelevant land and sea images. That’s about it for the first page of the Google query answer. so that the reasoner (FaCT++, Pellet, and the like) would classify it near-instantly, or if the ontology were to be really large, then still within an hour or so (ignoring for a moment the [*AND body shape similar to a wasp*] because that requires a bit more work). It would be even funkier if that ontology were linked to a database of images of insects to cross-check it with the visuals. Even more so when such a database also were to have information about its habitat with feeding habits, principal role in the food web, and any diseases it may cause or transmit. Then one would also be able to start the search from another direction along the line of “give me all the insects that live in the west of Ireland” as a first step to narrow down the possible answers. a) Google to work on their technology so as to be able to get the answer for me? b) Entomologists to develop their domain ontology about insects and link it to some database with pictures and additional textual information to have indeed a properly searchable knowledge base? c) Volunteer labour, like me having taken pictures and annotated each one with the physical characteristics, location, time of observation, etc. and categorise it as “bug” or “insect” or “insekt” or “insetto” to eventually have a grass-roots bugbase (that likely will have some imperfections with gaps in data fields and sloppy terminology)? d) Everyone to buy insect books? Shelving option d, I am explicitly looking for a computational option, i.e., a, b, c, or e. I prefer a web-accessible version of option b, which can be done with scalable Semantic Web technologies; one only needs to find the money, time, and people to realise it. Although I gave the example here with insects, the same story can be made for birds, worms, and so forth. When such searchable knowledge bases exist, it will not only save time for many lay people looking up the information and learning more about the flora and fauna around them, but I can imagine it will also make research a lot easier for interdisciplinary scientists who have to forage into knowledge of insects [/birds/worms/etc] as well as the entomologists [/ornithologists/nematologists/etc.] themselves. Alon Halevy, Peter Norvig, and Fernando Pereira. The unreasonable effectiveness of data. IEEE Intelligent Systems, March/April 2009, 8-12. Believe it it not, but the weather is indeed dry and sunny in Galway, already for 5 days in a row; although I did not come to Ireland for the good weather, it is a nice bonus. One of the reasons I am in Ireland is to visit the Digital Enterprise Research Institute (DERI) in Galway, which is the largest Semantic Web-oriented research group in Ireland with about 120 employees. I am hosted by Paul Buitelaar‘s NLP unit, looking into options to improve NLP implementations with ontologies, as DERI puts somewhat more emphasis on validation with applications than Bolzano does. In this context I gave a seminar about representing and reasoning over a taxonomy of part-whole relations, which is based on the Applied Ontology paper with the same title , but where the slides focus on the motivations from a linguistics perspective. It led some attendees to believe linguistics was the core motivation for disambiguating different types of part-whole relations. However, correct modelling of part-whole relations gets probably more attention in conceptual data modelling (primarily, UML) and it receives lots of attention in attempting to address the demands put forward by bio(medical) ontologists to (i) have a language with which one can represent all properties of parthood relations in ontology languages, which we still cannot in OWL, and (ii) distinguish between part-whole notions such as (spatial) containment, structural parthood, and membership of a collective. An orthogonal dimension to the types of part-whole relations are the notions of essential and immutable parts and wholes, which can be solved by resorting to a temporalisation of relationships . If one would want to ‘translate’ that to any usage in NLP, then one can deal adequately—with a formal and ontological foundation—with linguistic expressions that have a wider range of verb tenses, like “researcherAbc will become a member of researchGroup123” (a scheduled meronymic part-whole relation) and “heart#123 has been transplanted from patientAbc” (a so-called disabled relation where the heart used to be a structural part of that patient). But this is still music for future work. Other topics passed, and are passing, the revue as well, such as a possible use case with roles and rules with Axel Polleres, making it a stimulating and enjoyable visit. Artale, A., Guarino, N., and Keet, C.M. Formalising temporal constraints on part-whole relations. 11th International Conference on Principles of Knowledge Representation and Reasoning (KR’08). Gerhard Brewka, Jerome Lang (Eds.) AAAI Press, pp 673-683. Sydney, Australia, September 16-19, 2008.